CEA poses a number of problems as regards eradication and control. The 'go-normal' phenomenon, where the changes of mild CEA are masked in the adult dog by pigmentation of the eye, can lead to affected adult dogs being passed as normal on eye examination. For this reason, the best way of making a good diagnosis is eye examination of pups between 5 and 12 weeks of age, before this pigmentation takes place. Litter screening is an important part of any control programme. 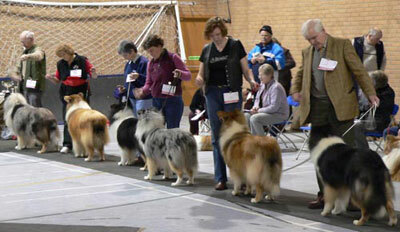 East Anglian Collie Association Open Show, Littleport, February 2006. DNA testing is now available, and identifies the gene for choroidal hypoplasia, which causes the pale patch in the back of the eyes of CEA affected dogs. This has a useful role in confirming a diagnosis of CEA based on ophthalmological examination, and can distinguish between genetically clear and carrier animals, which both have normal eyes on examination. These animals could only previously be distinguished by test matings (see Genetics for more details). The reason some animals show more severe signs of CEA than others is not well understood, but is probably due to the severely affected dogs carrying other genes which, in combination with the gene for CEA, produce colobomas, which can in turn lead to retinal detachments and haemorrhages and can lead to blindness. Although it would appear that breeding from mildly affected dogs tends to produce mildly affected pups, this is by no means guaranteed, and pups with mildly affected sire and dam can show the full range of severity of the condition. The prevalence of CEA (proportion of affected animals) varies enormously between breeds, and between locations. Even surveys of the same breed in the same country can produce quite wildly varying results. The following prevalences were found in the UK in the 1980s and 1990s. They should be considered a very rough guide to likely incidence in these breeds. Eye schemes vary in their classification of CEA. Most distinguish in their diagnosis between mildly affected animals with limited choroidal hypoplasia, more extensive choroidal hypoplasia, the presence and extensiveness of colobomas, and the presence of haemorrhage or retinal detachments. These can be graded on different scales, for instance 1-3, 1-5, or by description. You should contact the organisation overseeing eye testing in your area about local classification systems. There is a clear argument, from a genetic point of view, that the only meaningful clinical diagnosis is 'affected' or 'unaffected'. Since it is possible for mildly affected parents to produce severely affected pups, all affected animals should, in an ideal world, be removed from the breeding pool. What is the aim of control programmes for CEA? The basic aim of any control programme will be to avoid the birth of affected animals. As discussed in Genetics, this can be simply achieved by having at least one genetically clear dog in every mating. This will lead to the birth of clear or carrier pups, depending on the status of the other parent, and these pups should not show any signs of the condition. An obvious extension of any control programme would be aiming to eradicate the CEA gene from the population, so that the pups resulting from any mating in the breed would be clear of the condition. Can control and eradication be achieved? Whether eradication is possible will depend very much on the prevalence of the condition in the breed. In breeds where CEA is rare, eradication may be possible, since excluding first affected, then carrier animals from the breeding pool should be possible, if carrier rates are relatively low, without having to exclude too many animals with particular merit in other areas. An example of a breed where this may be possible is the Nova Scotia Duck Tolling Retriever, where current estimates are of a carrier rate of around 5%. The ISDS (International Sheep Dog Society) requires one genetically normal parent in any mating in order to register the pups. They do not permit matings between two carrier animals. Affected dogs may, if they have exceptional merit, be mated to a genetically clear animal, producing a litter of carrier pups. The aim of this scheme is to prevent the birth of affected dogs. Status is established by ISDS Eye Scheme examinations and genetic testing. In contrast, breeds with a high percentage of CEA affected animals are likely to have very few genetically clear dogs. Statistically, most of the unaffected animals are likely to be carriers. While breeding two carriers will produce some genetically clear offspring, it will be a very small pool from which to chose animals which have other desirable characteristics. It is this problem which faces breeders of the Rough and Smooth Collies and Shetland Sheepdogs. In these high-prevalence breeds, there has been a tendency in the last decades for breeders to continue to breed from mildly affected animals with otherwise desirable characteristics. 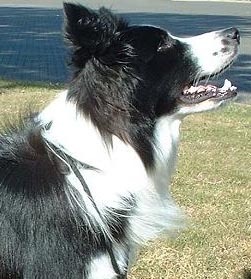 Research in Sweden, where this was the breeding policy in Rough Collies, showed an increase in the number of dogs with choroidal hypoplasia, without a matching increase in the presence of colobomas. Relatively, fewer affected animals were severely affected, though the increase in total numbers of affected animals counteracted this effect. Based on this result, it is difficult to recommend this as a breeding strategy, since continuing to breed from affected animals will only increase the proportion of carrier and affected animals in the population. It is clear, however, that in certain breeds there may be few alternatives palatable to breeders. Local breed societies should be able to offer guidance to their members on breeding and CEA in their particular breed and location.